everything had to rot and go back into the ground. We peeled the apple peelin's into a coal bucket. so that the peelings will rot back into the earth. part of what we just took away." Anndrena Belcher's tales are rooted in an Appalachian tradition centuries old, one that bridges the gap between humans and nature. Through performances, teacher in-service programs, and one-on-one workshops with children, Anndrena reintroduces our youth to the Appalachian land ethic of environmental stewardship. Her workshops use art as leadership development, highlighting the notion that each of us counts in the making of democracy. Students learn to define themselves through personal oral history, and in the process of self definition they learn to challenge our current extractive culture and protect the earth. Click on the news articles below to read more about For Old Times Sake's recent work. 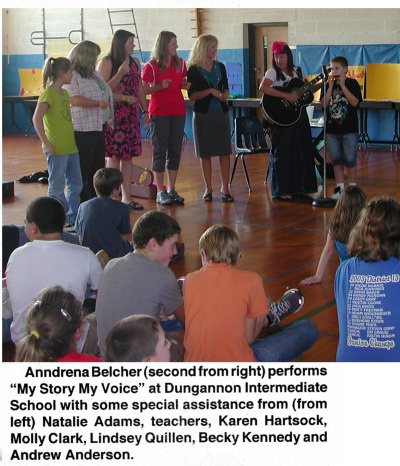 Or explore Anndrena Belcher's songs and storytelling through her website and myspace page.